Shutters are used to close shops , garages and warehouses. These are all places which house valuables and are therefore particularly at risk of theft. The shutter is the first protective barrier and the most frequently attacked point. For this reason, this is the first point to look at in order to increase security. Before assessing more challenging and costly solutions, you may wish to consider replacing the weak standard lock with an armoured lock. The new Viro 8270 Series patented and armoured locks makes the operation particularly simple . The case, which is made of thin, cut and bent sheet metal. 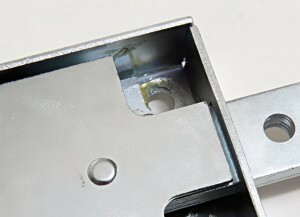 The case of common locks for shutters is made of thin sheet metal. 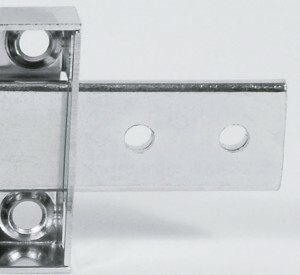 The dead-bolts, which are also usually made of bent sheet metal, which can be easily forced with a lever, such as a crowbar. Even the dead-bolts are very thin, and they can be easily bent with burglary tools. The cylinders, which lack any form of protection and often protrude, so they are easy to attack with chisels, hammers, drills and other burglary tools. 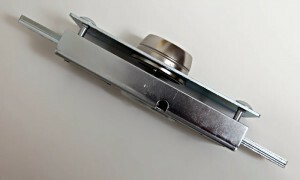 The cylinders of common locks for shutters jut out and have no protection. 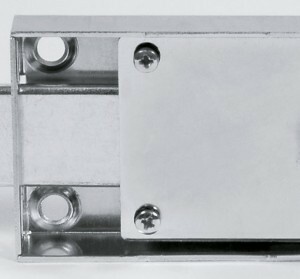 The case of the Viro 8270 Series armoured lock for shutters is made of galvanized steel with a greater thickness (2 mm). The dead-bolts of the 8210 Series armoured locks are 7 mm thick, in order to effectively withstand any attempts to break in. The cylinder is protected by a pull-resistant security escutcheon fitted with a rotating drill-resistant plate. Detail of security escutcheon with rotating drill-resistant plate which protects the cylinder of the Viro 8270 Series locks. 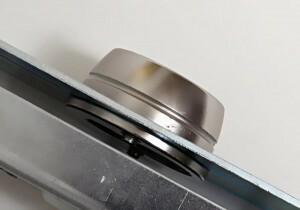 The rotating plate is the most effective solution against drilling as it not only prevents penetration of the drill bit, but, by rotating with the drill bit itself, it prevents it from gripping and moving forward, thereby also preventing internal mechanisms from being damaged, as shown in this video . The pull-resistant escutcheon with a rounded truncated cone shape withstands attacks by burglary tools, including the “metal pipe” method which is commonly used against ordinary defenders. The pull-resistant escutcheon of the Viro 8270 lock has a truncated cone shape so that it cannot be gripped by pipes or other burglary tools. 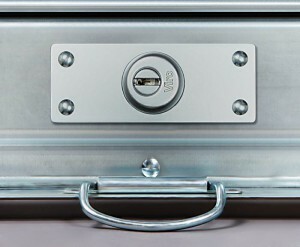 The entire lock is also protected by a 2.5 mm thick steel plate fastened outside, so as to enclose the steel sheet of the shutter between the body of the lock and the plate itself, thus forming an extremely resistant” sandwich”, and making it particularly difficult to pull of the lock. The Viro 8270 Series armoured lock complete with protective plate. The steel sheet of the shutter is enclosed between the case and the protective plate so as to form an extremely strong unit. The security can be further increased by appropriately selecting the cylinder. 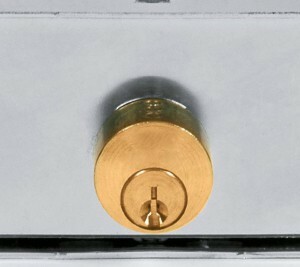 The lock can house any European profile cylinder, even a high security type. The model which best suits your needs can therefore be selected. You can use either a half cylinder, if it is only necessary to open and close from the outside, or a double cylinder, if it is to be operated also from the inside. The Viro 8270 Series locks can be fitted with any type of cylinder or half cylinder with a European profile, thereby enabling any system of master keys to be created with other existing cylinders. Replacing a normal original lock with the new Viro armoured lock is particularly easy, as the centre-centre spacing of the fixing holes is the same as for the most commonly used models. It is not therefore necessary to drill new holes in the shutter, but simply widen the existing ones so as to be able to use the case-hardened drill-resistant fixing screws with pull-resistant heads (supplied) with a diameter of 6 mm (instead of the 5 mm commonly used). The only operation required on the shutter is the widening of hole through which the old cylinder passes, which is necessary in order to house the new security escutcheon. To simplify the operation an accessory is available which allows you to drive the drill in the exact position, as shown in this video . 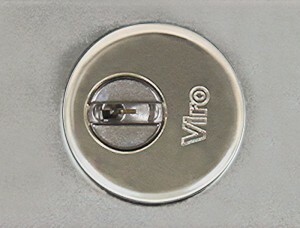 The compatibility between the new and the old locks is guaranteed by the fact that Viro 8270 Series locks are available both in the versionwith a double dead-bolt, for mounting in a central location, and with single dead-bolt, for mounting in lateral position, either on the right or left-hand sides. Increasing the resistance of a shutter is especially simple and effective with the new Viro armoured lock. 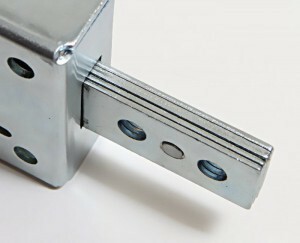 An excellent lock is in fact the first step towards improving the security of your shop, warehouse or garage. A Viro 8270 Series fitted on a shutter. From the outside it is only possible to see the protective plate, the security escutcheon and the drill-resistant plate. This entry was posted in Locks and tagged home, locks on 9 June 2014 by Mara Rossi.